Neat at Barcelo Madrid Tower Hotel. It pours clean dark golden, some amber highlights. Aroma is very intense and sweet: vanilla, crème brûlée, pudding, caramel: all that. Some red hot pepper and tobacco as well. Mouthfeel is pungent and warm, mouth-covering, dry and quite long-lasting. Smoke in the aftertaste. 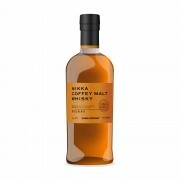 Nikka Coffey Malt Very Smooth. Very Smooth.